Graphene Center Laboratory is State of the Art "Nano-Factory"
Our researchers will use the new Graphene Laboratory to investigate the extraordinary properties of graphene. Graphene is an amazing material offering high strength, transparency and flexibility with excellent electrical and thermal conductivity, all from a single layer of carbon atoms. 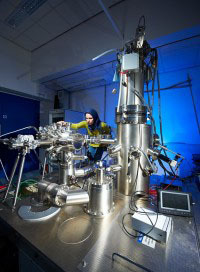 To further understand and research all the possibilities of graphene, the Graphene Center Laboratory was opened at the University of Bath On May 1st. Forty times stronger than steel and conducting electricity ten times better than silicon, graphene is the wonder material that could one day replace silicon in microchips. Now the University is opening a new Graphene Center Laboratory that will study its amazing properties and develop its potential applications. Graphene could be used to develop faster electronic devices, for example more advanced mobile phones and super-fast computers, flexible touch screens, and medical sensor devices. The new laboratory, officially opened by our Vice-Chancellor Professor Dame Glynis Breakwell on Tuesday 1 May, forms part of the Center for Graphene Science, which brings together expertise at the Universities of Bath and Exeter. The new laboratory at Bath is home to a range of state of the art equipment, including a specially adapted scanning probe microscope – nicknamed the “nano-factory” – that can build new materials and create rapid prototypes of novel devices that have never been made before. Dr Peter Sloan, Lecturer in Physics added: “With the nano-factory, we can also build up bespoke atomic-scale structures one atom at a time to link with the stenciled devices, making our new microscope world-leading. Researchers will also use the new Graphene Center Laboratory to investigate the extraordinary properties of carbon nanotubes, rolled sheets of graphene some 50,000 times narrower than a human hair. Dr Ilie has combined nanotubes with other elements to make hybrid carbon nanomaterials that are electronically patterned like striped candy canes; the stripes are so narrow that electrons are “guided” along them, suggesting they could be used as electronic connections in a quantum computer. The Center for Graphene Science has been funded by strategic investments by the Universities of Bath and Exeter into materials research, and by a £5 million award from the EPSRC/HEFCE Science and Innovation Awards Scheme 2008. Be the first to comment on "Graphene Center Laboratory is State of the Art “Nano-Factory”"